My hypothesis is that the earth has a thermoregulatory system keeping the global temperature within narrow bounds (e.g. ±0.3°C over the 20th century). What I'd like to know is what planet Willis lives on. Where does he get his "±0.3°C over the 20th century" from? How could any person claim that in the twentieth century, global mean surface temperature stayed "within narrow bounds (e.g. 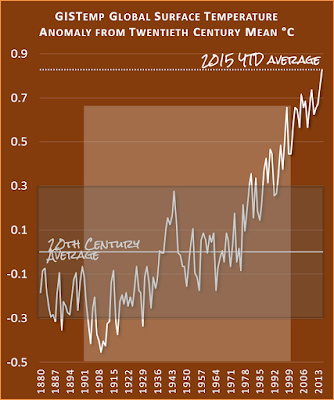 ±0.3°C over the 20th century)". Look at how it jumped out of all bounds in the 1970s. How the span from the beginning of the century to the end was in the order of 1°C. 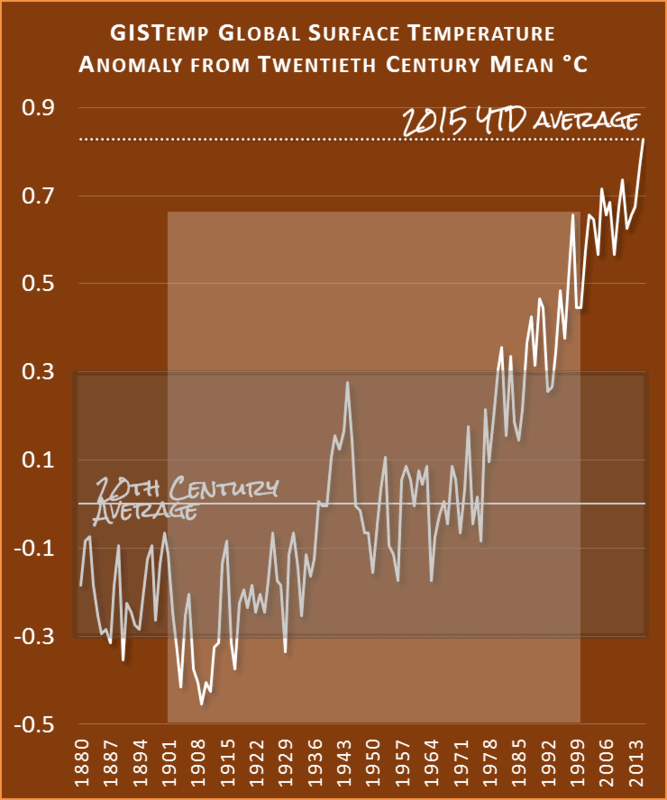 The only time it fluctuated around ±0.3°C was for a few years mid-century. Over the whole century it just kept going up and up and up. Why does Willis keep making that claim when it's easily shown to be complete nonsense? Willis claims his thermoregulatory mechanism for himself. In reality it's not much more than his version of the hydrologic cycle, which was described decades before Willis was a twinkle in his father's eye. Powerful storms send heat aloft in the atmosphere, then the water rains down. The water cycle is one of the main reasons why earth doesn't just heat up forever when there's a positive forcing. The evaporation and condensation of water helps keep the planet's temperature in check. Why Willis doesn't just read science to learn about this stuff is another good question. There's nothing wrong with trying to figure it out for yourself. It's a good way to learn. What makes him look a bit silly is that he doesn't seem to know that he's not coming up with anything that scientists don't already know. He thinks he's invented the study of weather phenomenon. (Yes, he's writing about weather, not climate.) And he gets quite a lot wrong and omits some important bits. Here's a better explanation of how it all fits together than Willis' hotch potch - from Prof. Stephen A. Nelson of Tulane University. For a more complete picture and in context of climate rather than weather, David Archer's video classes are excellent. From reading Willis' numerous articles on his hypothesis, he seems to be wanting to resurrect Richard Lindzen's unsupported Iris Hypothesis. You might recall his blow-up with Roy Spencer, who told him to read science before making claims that he's the first to discover something. For a change, Willis' article got a few challenges. Still, no one picked him up on his false claim about the twentieth century temperatures. I guess that would be a step too far for deniers. joelobryan will gobble up any nonsense, like a true blue fake sceptic. Is he a greenhouse effect denier or does he just think water vapour isn't a greenhouse gas? Nice work. More evidence the tuned positive feedback of water vapor forcing in the GCMs is dead wrong. Have looked over Dr Roy Spencer’s latest blog post on his work in regards to water vapor feedbacks measured with the AMSU and its comparison to a GCM tuned water vapor forcing? Salvatore Del Prete - well, I've not seen anyone challenge Willis before, but here is another denier doing so. Excellent! Willis says but the only problem is it does not work in the long run, or even in the short run as is evidenced time and time again by the many abrupt past climatic changes, and the changes from a glacial to inter-glacial state. Talk about insane here Willis has a theory that is PROVEN to be wrong by the historical climatic record and yet he goes right ahead and criticizes al other climatic theories that conform to the historical climatic record such as the one I have proposed. Now that does not make sense to me. Martin Clark also pops up with a challenge. Can you tell us how your hypothesis accounts for/allows glaciation? How can “Snowball Earth” happen? Another Martin Clark complains that it wasn't him who wrote that comment. Thanks very much not only for the work in the main post but also for pulling together the previous posts on the same subject. I have almost always found them compelling. My hypothesis is that the earth has a thermoregulatory system keeping the global temperature within narrow bounds (e.g. ±0.3°C over the 20th century). A major part of this thermoregulatory system is that the tropical cumulus and thunderstorms act to limit the tropical temperatures on both the warm and cool ends. I understand the daily processes you describe but there must be larger forces that overwhelm or cancel out this thermoregulatory system outside of the tropics since the earth has seen multiple ice ages. Or are you saying that for short periods of time this system works to maintain whatever climate/temperature the earth happens to be experiencing? Willis Eschenbach repeats his false claim here. I've noticed that he doesn't ever put up a chart of twentieth century temperature trends. It would blow his claims of no change and stability to smithereens. Thanks, Salvatore. It’s clear that you don’t understand what an amazing thing it is that the 20th century temperature varied by only ± 0.3°K. Since the average global temperature is on the order of 290K, that means that this is a system which is thermally stabilized to within a tenth of a percent....We can debate just what kept the temperatures so stable over the 20th century … but it’s obvious that something kept them stable. In addition, for unknown reasons, about a million years ago the climate took up a condition we can describe as “bi-stable”. Although it is statistically related to the Milankovic cycles of the earth’s orbit, it is not clear why this change to ice ages and interglacials happened a million years ago, and not five or fifty million years ago. And even the variation ice age to interglacials to ice age is only about ± 2.5°K, or about ± 1%. So in the interglacial the regulation is to ± .1%, and over the last million years the regulation is still to ± 1%. Bravo Willis. This is real climate science. Obviously it is not the final word, but the regulation mechanism is highly plausible and fits well with observations. In principal I like the theory but I think you’ve spent long enough finding reasons to believe in it. I think to give it credibility you need to think of reasons why it might not be true and try your hardest to prove your own theory wrong. The fact we move in and out of ice ages, on the surface, disproves it. Long term warming or cooling trends also seem to disprove it at some level. You concentrate on the tropics with its thunderstorms but cant really say with any confidence whether non-tropics changes rule the overall climate. There are quite a few areas you could consider. Might be a bit more arresting graphically.. The only way to describe several C of change as <1% is to use the Kelvin scale and base your percentage on absolute zero - I can't think of a clearer demonstration of misleading numerology than such an absurd rhetorical trick of choosing a scale where changes appear to be small. When you're using percentages with temperatures the only way it can make sense is to use an absolute temperature scale like Kelvin. Dismissing climate change by using percentages of an absolute scale zeroed far outside any possible real-world conditions, such as Kelvin, is deceptive - the total change between the coldest ice age and warmest part of the Eemian is about 5-8C total, a _relevant_ range for life on Earth. In which case 2.5C, the number Eschenbach mistakenly uses, is 30-50% of that _relevant_ variation. Posing numbers in scales where they _appear_ to be small, while ignoring the all too real effects of those numbers, is a classic emotive rhetorical trick. There's an excellent (and very funny) post on this at DenialDepot. riverat...Depends very heavily on what kind of sense you are trying to make: Sense relevant to life on Earth, or sense relevant to an absolute scale that has nothing whatever to do with life on Earth. An absolute temperature scale is measured against an absolute temperature (absolute zero). The difference between 10 K and 15 K is 50%. The difference between 10 degrees C and 15 degrees C is only 1.7%. I agree that in terms of relevance to life on Earth it's easier to think in terms of the Celsius scale but you have to convert it to an absolute scale before you can start talking about percentages. "...you have to convert it to an absolute scale before you can start talking about percentages." When the chosen percentages are all but irrelevant to the scale that matters to us, such a choice of presentation in terms of that irrelevant percentage is in fact misleading rhetoric. If I present the human LD50 (lethal to 50% of the recipients) dose of a toxin as the LD50 percentage for the mass of the average blue whale, I'm expressing it accurately on an absolute scale (if there is agreement on the average weight of a blue whale). It's also utterly uninformative and in terms of human lethal doses ("Here, try some, it's only 0.5% the LD50 for a blue whale..."), it's a deceptive presentation. Willis should aim higher. Though inane, Miss Elk's theory on brontosauruses at least had the advantage of being correct.